Exhibitioncatalogue from The Queen's Gallery, Buckingham Palace starting in November 2018 : "Through war, alliance and dynastic marriage the relationships between Britain and Russia and their royal families are explored from Peter the Great's visit to London in 1698 through to Nicholas II. Portraits, sculpture, photographs, archival documents and miniature masterpieces by Fabergé illustrate historic events and family meetings between the rulers of the two nations. 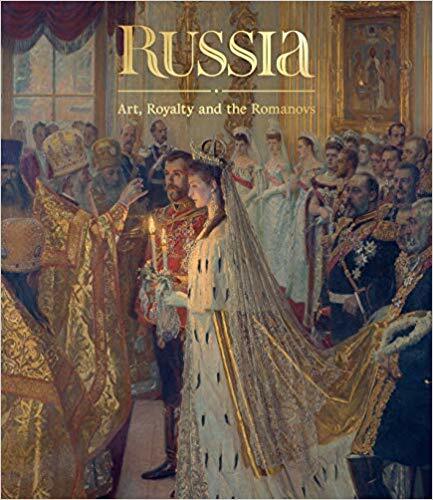 Many of the rich and varied works of art to be displayed are unique – some commissioned as grand diplomatic gifts, others as intimate personal mementos between the royal family and the Romanovs, and they bring to life the shared patronage of artists and craftsmen from both countries" Hardback, in English, 496 pages, illustrated, size 23.5 x 26.7 cm.